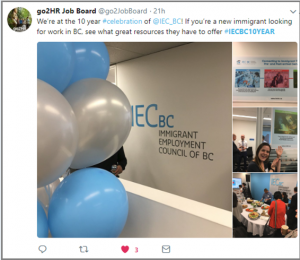 Over 150 guests attended IEC-BC’s Open House, as the organization officially launched its 10-year anniversary celebrations on May 9, 2018. It was an opportunity to reflect on a remarkable journey and share its vision for the future. IEC-BC was launched at the Metro Vancouver Summit on Immigrant Employment in October 2008. It started off as an initiative of the Vancouver Foundation, and has since grown to be an independent not-for-profit organization. In the past 10 years, it has given hundreds of BC employers the tools and resources they need to hire and retain the newcomers they need to grow their business and advance BC’s economy. launching BC JobConnect – an online forum for newcomers to present their skills to hiring employers across BC.